There are several reasons that you might need an Alamo electrician. Most of our calls aren’t for new home construction, although we do quite a bit of that type of work, usually we get called in to add 220V service or to rewire faulty electric fixtures. More often than not, we are able to fix the issue within just a few hours of being called. This is because we are highly trained, expertly skilled electric contractors. It might shock you to find out that not every electrician needs to be licensed by the State of California to offer services in Alamo, but it’s true. 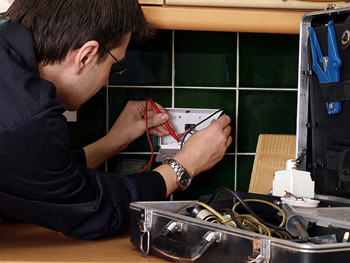 All of our techs carefully licensed and insured to handle every electric issue that may occur in your home or business. Don’t trust your electric work to an unlicensed contractor, a contractor that does work “on the side” or a handyman that claims to be a “jack-of-all-trades.” We specialize in electrical installation and repair. It’s all we do. While it isn’t illegal to install your own wiring, there are several specific codes that must be followed to make sure that all of your fixtures and lines are safe to use. New installations are required to be inspected be a local official. If you’ve done the work yourself or had someone who isn’t licensed do the work, you may be required to remove the wiring and have it redone to meet standards. Our professional Alamo electricians make sure everything is up to code before we leave. You’ll never have to worry about passing an inspection when you’ve hired us. By calling in our expert electrical contractors in Alamo CA, you’ll be getting the best service in the city. We have an unblemished service record and the friendliest contractors in the area. Call us now to get an estimate today.